Last weekend lied to me. (sometimes weekends are like that) It’s not Fall here in Maryland. High 80’s is not Fall. I will have to take matters into my own hands. I will do it myself. I will make my own Autumn. 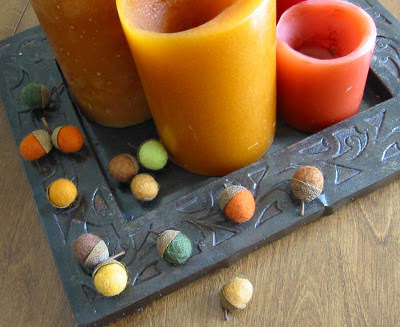 I’ve been sprinkling the felted acorns all around the house to see where they might bring us a little autumnal cheer. Now for some foliage. 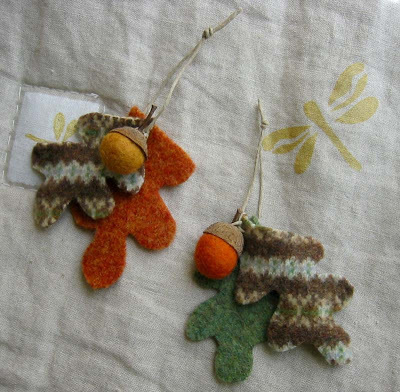 I dug out some felted sweater scraps and free handed some oak leaves. I was thinking along the lines of a garland with leaves and acorns hanging from it. Blair did one last year and it was so pretty. I strung a few leaves onto some hemp cord. I thought it had a nice stem look going on. Hmmm…then I had another idea. I got out the drill. It’s hard to see in this photo, but I drilled two tiny holes in the acorn cap on either side of the stem. I laced the cord down through the cap from the top, back up, then tied a half knot by the stem. 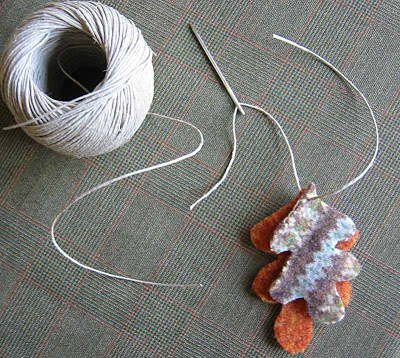 Then using a tapestry needle I re-threaded the leaves back onto the cord and knotted the ends together. A little glue, a few felt balls…viola! the leaves and acorns are so cute! love them! These are a really lovely way to keep autumn around all year. Super! those are tooo cute! Simple charming, Betz! Love ’em!!! Would you ever considering tossing a few into your etsy shop? Gorgeous! I just felted my first sweaters in similar colors…I think you may have just inspired my first felted project! Thanks! Hi- Left Illinois for Maryland 11 years ago and Maryland has no fall season, I’m sorry to say. It will be very short, and then into winter. Similarly, there’s a short spring too. I moved back to Illinois this year, and I’m loving the fall. I LOVE the little leaf ornaments! And the acorns too. Oh no! Don’t tell me that…I might have to wallow in candy corn again, and we wouldn’t want that. Your little acorns are just too cute! If anyone could do something special and new with these, its you. Love the added acorns! I love the leaves and acorns! Well golly! Isn’t that clever and cool! Never would have thought of drilling holes in acorn caps. Your creative mind astounds me! Think I’ll have to be satisfied with Brazilian nuts! 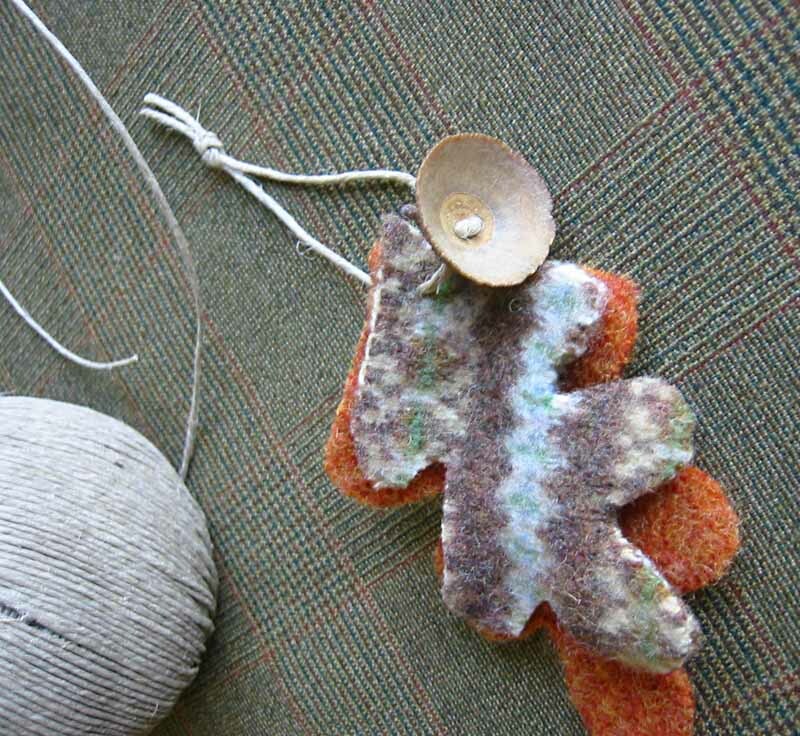 I love the idea of the garland….hmmm….perhaps I’ll go make some now!!! Thanks for always being an inspiration…I’m sure you have no idea just how many people you inspire! OHHH!!! I like them very much. So cute! Saludos desde Barcelona. i love those – all of them. they are so very beautiful! you can do ANYTHING with a sweater! Those are adorable. You are so very talented. I wish I had half of our talent. I have been hunting in all the charity shops near to us for wool jumpers that I can felt – they all seem to be machine-washable wool now! It’s getting to the stage when I’ll have to knit a jumper just so I can felt it to make some of your lovely things. I need some acorns! Your site gives me so much inspiration, I love it. They’re fantastic. I found my first proper-looking acorns of the autumn yesterday – beautiful glossy brown with lovely little caps; none of this green under-ripe acorn rubbish! – and thought of you. Inspiring stuff. Your acorns are fab, and good luck with the book I am going to pre order a copy now from Amazon. Love your acorns, so cute. I have a purse to felt this week! 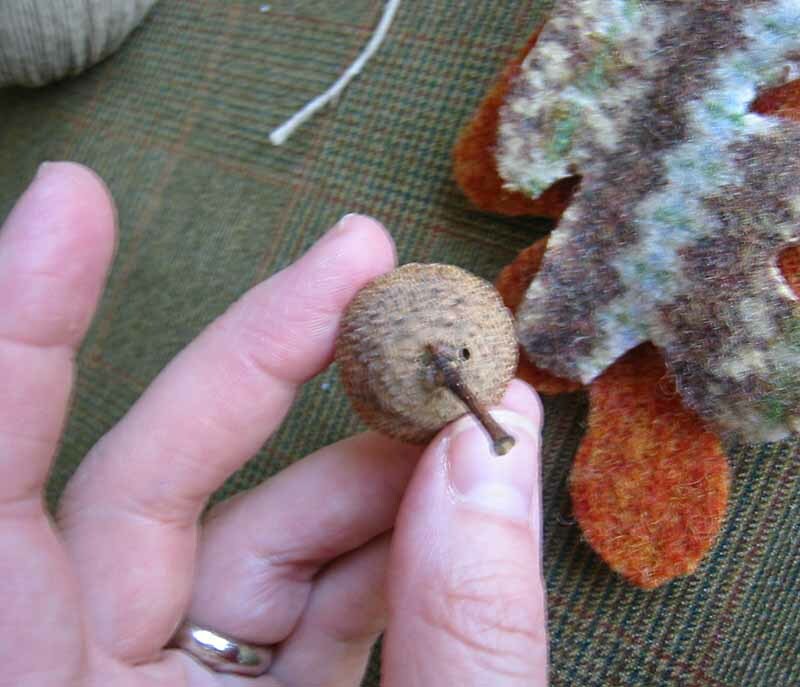 Your little felted acorns are too cute! LOVE those acorns (I love anything with acorns and those are about the cutest I’ve ever seen!). I live in nearby Northern Virginia (well, I’m not sure where in MD you live) but don’t worry, this year is not indicative of our normally lovely fall season. Spring is beautiful, too, except when it gets too hot too fast and all the spring flowers melt. Summer is another story. Very cute. They look very cozy too. I I just stumbled on your site. 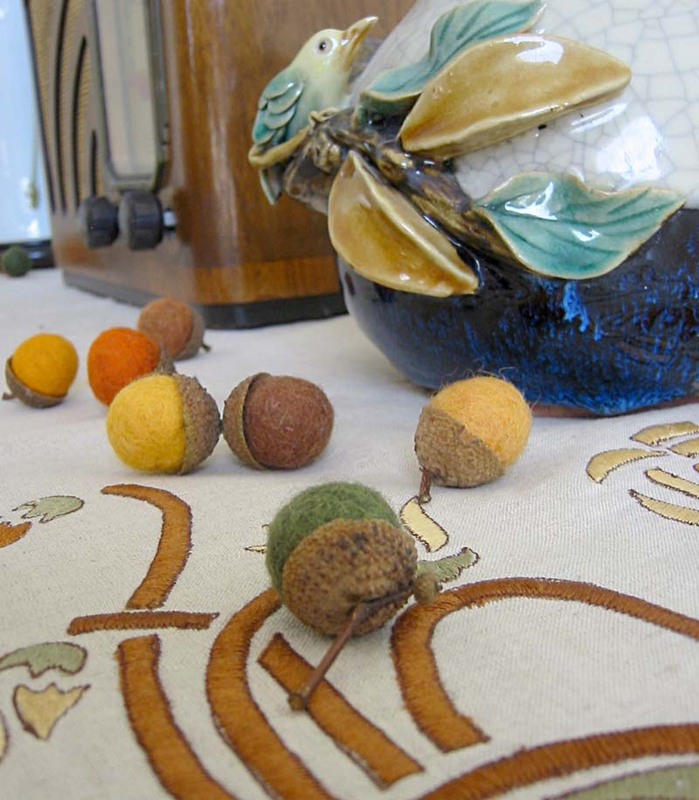 I had to comment on your felt acorns…they are so cute! 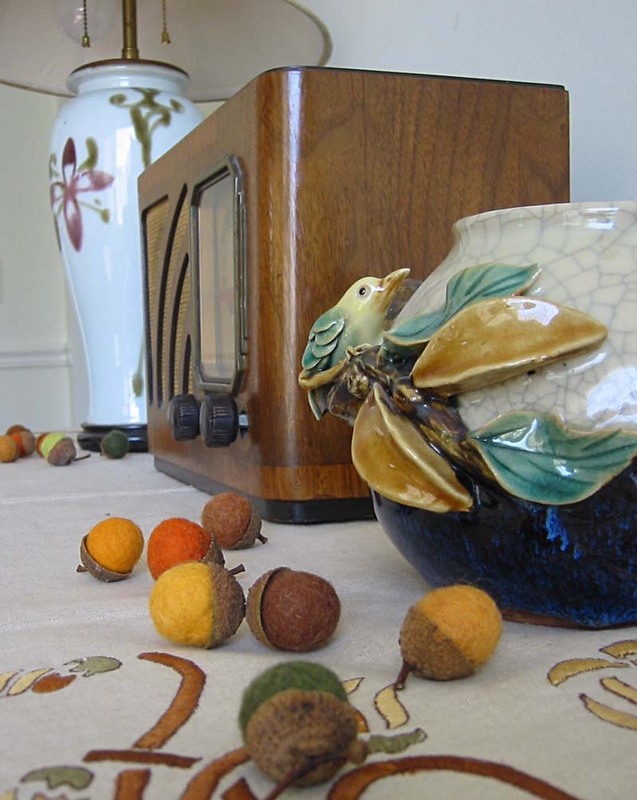 I am really late with this comment put I just had to say these acorns are great! Those leaves and acorns are beautiful. I’ve been so inspired by your lovely work! So cute — I would love to decorate my home with these!